Donald McNichol Sutherland OC (born July 17, 1935) is a Canadian actor. He has appeared in more than 100 movie and television shows. 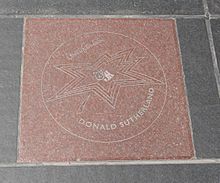 Sutherland is known for his roles in Fellini's Casanova, Klute, Don't Look Now, Invasion of the Body Snatchers, JFK, Ordinary People, Pride & Prejudice, and The Hunger Games. He is the father of actor Kiefer Sutherland. Sutherland was born in Saint John, New Brunswick. His ancestry includes Scottish, as well as German and English. When Sutherland was a child, he had rheumatic fever, hepatitis and poliomyelitis. He studied at Victoria College and at University of Toronto. He studied acting London Academy of Music and Dramatic Art. Sutherland started off working as a radio DJ at the age of 14. Sutherland's acting career began in 1962 with a small role in the television series The Avengers. He then starred in some major roles in movies such as Dr. Terror's House of Horrors with Christopher Lee. He had a recurring role in the 1970 television series M*A*S*H.
Sutherland soon gained fame in the Academy Award-winning movie Klute with Jane Fonda. He then starred in the movie Don't Look Now. He then starred in the movie Buffy the Vampire Slayer. Recently, Sutherland portrayed President Snow in the movie adaptation of The Hunger Games, released in March 2012. He repeated the role in its sequel, The Hunger Games: Catching Fire (2013). In 2018, Sutherland will play J. Paul Getty in the television series Trust. Sutherland was married to Lois Hardwick from 1959 until they divorced in 1966. Then he was married to Shirley Douglas from 1966 until they divorced in 1970. Since 1972, Sutherland has been married to his current wife Francine Racette. He has five children, three of whom are actors. Sutherland became a blogger for the American news website The Huffington Post during the 2008 United States presidential election campaign. In his blogs, he openly stated his support for Barack Obama. During the Opening Ceremony of the 2010 Winter Olympics in Vancouver he narrated the events. He was also one of the Olympic flag bearers. ↑ "Donald Sutherland Biography". filmreference. 2008. Retrieved 4 April 2008. ↑ Buckley, Tom (17 October 1980). "At the Movies". The New York Times. ↑ "Donald Sutherland". Barnes and Nobel.com. Retrieved March 17, 2014. ↑ Mark Cousins (19 March 2001). "Donald Sutherland – Jane Fonda, "Klute", and "Don't Look Now". BBC. Retrieved 4 April 2008. ↑ "Rudolph Giuliani to deliver Middlebury College commencement address May 22". BBC. 10 March 2005. Retrieved 4 October 2013. ↑ "Hollywood Chamber of Commerce". Hollywoodchamber.net. Retrieved 2 March 2011. ↑ "Donald Sutherland receives French honour". BBC. 10 June 2012. Retrieved 10 June 2012.